An amazing thing happened the other day. I got up at the usual time, staggered down the hallway, paused long enough to turn on my computer, then continued another few feet to turn on the coffee maker. But first I had to make the coffee so I turned a tap and clean, safe drinking water came pouring out of a faucet. Then I opened a can and there was a lovely pile of dark brown coffee, grown thousands of miles away but sitting right there in my cupboard. A few minutes later and there was a steady flow of exquisite coffee was streaming into the pot. So far, nothing amazing or even out of the ordinary. After reading the on-line news from various news outlets around the world, I needed to warm up my coffee so I popped the mug into the microwave and zapped it for a few seconds. Ahh, nice hot coffee. Not amazing but very satisfying. Then, after a quick sandwich made from cold ingredients snatched from the fridge, I decided it was time for a shower. Turn another couple of taps and voila, hot water. Flip a switch, extra lights in the bathroom. Still nothing too amazing. After getting dressed I was faced with a dilemma: do I watch live coverage of the space shuttle launch on my computer or live coverage of the soccer game between Toronto FC and the LA Galaxy? This was easily solved by sliding a tape into the trusty old VCR and taping the game while settling in to watch the launch of the most complex and expensive machine ever built. From the earth’s surface to an orbit in space in slightly more than eight minutes. Eight minutes to get completely off our planet! But since this kind of event has happened several hundred times by now (counting the shuttle as well as various unmanned satellites), even that was not the amazing part. No, the amazing thing was a small headline I had missed earlier in the day when reading the news. 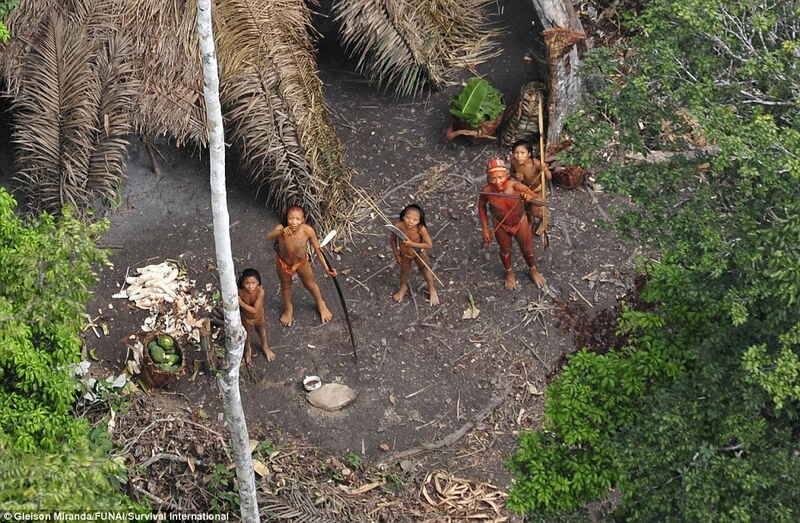 The Brazilian government had just announced that one of its planes had flown over a very remote part of the Amazon rainforest along the border with Peru, and had discovered some people. But not just any people; a small group of people who were living in a region that has never been explored. I other words, people who have never made contact with the rest of the world! The was a photo taken from the plane. A long house structure with a grass roof was visible between the trees. Beside it were three people. One of them, who seemed to be female, was either very dark-skinned or painted with a dark pigment, and was leaning away, as if getting ready to run. The other two were obviously males, painted head-to-toe with a bright red pigment, and both of them were leaning back, with one arm forward and the other near their face. It took a moment to figure out what they were doing – they were taking aim at the plane, with very large bows! The article stated that the government of Brazil was certain that no one had ever ventured into that region of the Amazon. So these three people were (there’s just no other way to describe it) completely wild. They wouldn’t have running water, internet connections, television, VCR, microwaves, light switches or even a coffee maker. If they were afraid of a small plane flying over, what the hell would they have thought about the space shuttle? It is truly mind numbing to think that in 2008, there are people on our world who have no concept of electricity, or powered flight, or even soccer. No use for an electric appliance, no need for a fridge to keep things cold or a microwave to make things hot. No need to communicate with people on the far side of the planet. Do they even know about the size of the planet? Or that it is, in fact, round and not flat? On the other hand, maybe that’s not so bad; the mystery of the “outside world” would have sheltered them from the more appalling aspects of human society. They have been spared the never-ending news stories about the US election, or the antics of Paris Hilton. They don’t have to worry about rising gas prices or the slowing economy. Taxes, jobs, bills, the Iraq War; none of that will have ever troubled their minds. Maybe, in this perverse way, they are luckier than us. Lifestyle gurus keep telling us to simplify our lives, to slow down, to enjoy life. But could any of us live without electricity, Starbucks and American Idol? So that was the amazing part of the day, discovering that while we are smugly transforming our world to “make it better”, while simultaneously heading out into space, there are others for whom all our efforts and successes mean nothing. And if they have been able to survive all this time in a place as wild as the Amazon, chances are their lives are every bit as rich and enjoyable as our own. Hopefully, we will never know. Hopefully, we will have enough sense to leave them alone.